Here at Mayfair Foods HQ we love celebrating! 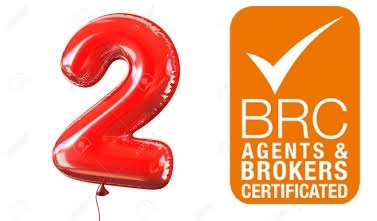 It’s with great pleasure that we can finally share with you the exciting news that we have been awarded the BRC Global Standard for Agents and Brokers for the second year running! This fabulous achievement comes after a year’s hard work and investment from everyone at Mayfair Foods. Having our BRC accreditation helps us to demonstrate our continuous commitment to food safety, trace-ability throughout the supply chain and high standards of procurement..
Whatever your purchasing requirements – our team will ensure that you receive an unparalleled service with a focus on food safety! Looking for an ingredient? Why not speak to us and see the difference for yourself!